With the number of Democrats who’ve opted to challenge Donald Trump’s reelection in 2020 now well into double digits and growing, it’s notable that so far only two, Bernie Sanders and Elizabeth Warren, have put down markers on foreign policy. Both, hailing from the progressive wing of the Democratic Party, have outlined in some detail the principles that, they say, would guide their approach to foreign affairs as president. Both outlines, of course, should be considered works-in-progress. Neither Sanders nor Warren have much of a track record when it comes to national security, and in 2016 the Sanders campaign was widely criticized for its relative lack of anything to say when it comes to the American role on the world stage. But, for 2020, both Sanders and Warren have declared, in some detail, what they believe. And because they have, the long-running, sometimes querulous discussion of whether or not “the left” has a foreign policy is about to transition from the theoretical to the practical. 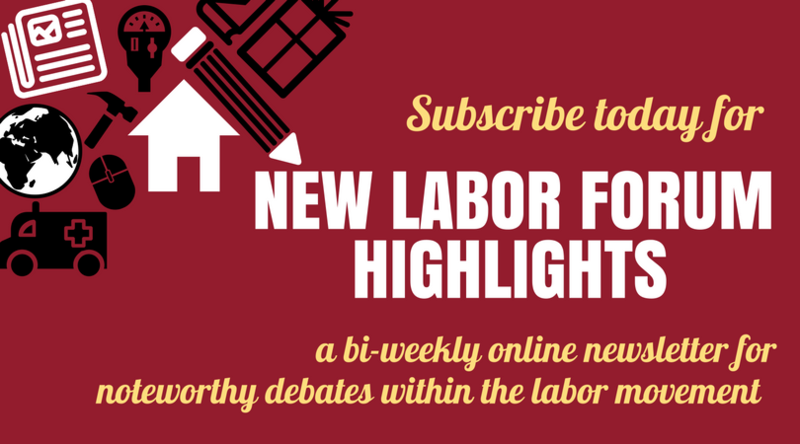 Journalists, academics, and various progressive activists and organizations have not been shy about saying what they think the left’s approach to foreign policy ought to be. All in all, many have made valuable contributions to the discussion. But none of them are running for president, when one’s views on foreign policy have to be measured not only against the standard of what’s morally correct and necessary but what can survive the relentless scrutiny that will determine whether or not Sanders, Warren (or one of the other Democrats) can win the nomination and defeat Trump next year. By that yardstick, what the two progressive Democratic senators have done is quite remarkable. Not since the 1972 George McGovern campaign, who aligned his rhetoric with the anti-Vietnam war movement, has a major candidate for president of the United States tried to win a national election with a defense, foreign policy, and national security platform anything like what Warren and Sanders have put forth. Sanders presented his ideas in a 2017 speech at Westminster College and in a 2018 address to Johns Hopkins’ School of Advanced International Studies, and Warren in a 2018 speech at American University and in a piece written for the January-February issue of Foreign Affairs. Both have a lot in common: both point out that the effects of inequality and the power of the one percent and the corporate elite don’t stop at America’s borders, but are worldwide in scope. Both emphasize the rising authoritarianism, oligarchy, kleptocracy and ultra nationalism that can be found from China and Russia to places such as Turkey, Hungary and Brazil. Both say that democracy is under siege worldwide. Both call for winding down the wars in the Middle East and Afghanistan, ending the Global War on Terror, and cutting the Pentagon’s budget. Unlike Warren, however – who doesn’t mention Israel in either her speech or her Foreign Affairs essay – Sanders directly takes on Israel, Benjamin Netanyahu, Sheldon Adelson and Robert Mercer for promoting “a shared agenda of intolerance and bigotry,” along with authoritarianism, in both the United States and Israel, and “the same anti-immigrant, anti-Muslim agenda.” And Sanders takes note of America’s long Cold War history of supporting dictators, coups d’état, paramilitary wars, and outright wars in places such as Iran, Chile, Central America, and Vietnam, in addition to the invasion of Iraq. For the most part, what Sanders and Warren have put forward has been well received among the left-leaning commentariat, though some have quibbled. But so far, none of the other candidates, have seen fit to take on either Warren or Sanders, either directly, by criticizing their views, or indirectly, by stating opinions to the contrary. That may change soon, however, as other candidates enter the race. Former Vice President Joe Biden, with a decades-long record on foreign policy (including his vote in favor of the war in Iraq) isn’t likely to align his positions with Sanders or Warren. And an insouciant “national security Democrat,” Representative Seth Moulton of Massachusetts, may jump into the race, too, if only to promote his own hawkish tendency. The darkest of dark horses, Moulton says that if he runs it’ll be explicitly to force the other candidates to justify their relative dovishness. In 2018, Moulton – who served four tours in Iraq – spent more than $4 million through his Serve America PAC, recruiting military veterans and former national security officials to run for Congress. Meanwhile, conservatives are already praising Moulton as heir to the Democratic Party of Scoop Jackson and Sam Nunn. Although the party is traveling leftward on issues from the Green New Deal to Medicare-for-All, Moulton may be right that the party – at least its chief elected officials, its former officials, and its foreign policy priesthood – is firmly anchored in the center-right. Perhaps that’s why Kamala Harris, Kirsten Gillibrand, Amy Klobuchar, Cory Booker et al. have chosen to avoid the subject. In Congress, the leaders of the main foreign policy and defense committees lean center-right: for instance, Eliot Engel, the chairman of the House Foreign Affairs Committee, and the two ranking Democrats on the Senate Foreign Relations Committee, Bob Menendez and Ben Cardin all opposed the Iran deal that President Obama negotiated in 2015. A newly established organization, National Security Action, led by two former top Obama aides, Jake Sullivan and Ben Rhodes, has assembled a list of fully five hundred national security experts who offer their services to 2020 candidates for president and Congress. And, as Moulton will tell anyone who’s listening, much of the 2018 freshman class in Congress – far from aligning with Alexandria Ocasio-Cortez, Rashida Tlaib, and Ilhan Omar – is comprised of centrist, pro-defense Democrats who were helped by the likes of Moulton’s Serve America PAC, many winning in conservative or GOP-leaning districts. It’s that apparatus, whose wheels are greased by the lobbyists and donors from the military-industrial complex, that Sanders and Warren will find themselves up against as the campaign unfolds. The United States has been in a state of continuous, global, open-ended military conflict since 2001. Over 2.5 million troops have fought in this “Forever War” in over a dozen countries – including Afghanistan, Iraq, Syria, Yemen, Jordan, Niger, Somalia, and Thailand. I pledge to the people of the United States of America, and to our military community in particular, that I will (1) fight to reclaim Congress’s constitutional authority to conduct oversight of U.S. foreign policy and independently debate whether to authorize each new use of military force, and (2) act to bring the Forever War to a responsible and expedient conclusion. So far, both Sanders and Warren have signed it. One of the ironic paradoxes of the 2016 presidential election is that Trump portrayed himself as an off-again, on-again opponent of the wars in Afghanistan, Iraq, Libya, and Syria. Measured against Hillary Clinton, who voted for the war in Iraq, who pushed for the attack on Libya, and who urged President Obama to set up a no-fly zone in Syria and to get more deeply involved in that civil war, Trump appeared too often as the dove in the race – despite his support for reinstating torture, seizing Iraq’s oil, and killing the families of terrorists. But Trump, in his erratic populism, sensed that Americans were weary of the wars and didn’t understand why the United States was still fighting them. Since he took office, Democrats have expressed various degrees of horror and approbation over his disparagement of NATO, his decision to get out of Syria and Afghanistan, and his (admittedly, less than careful) diplomatic engagement with North Korea. That, as McCoy suggests – and as Sanders and Warren seem to grasp – is woefully out of step with the inherent, antiwar instincts of the American voter. It remains to be seen whether or not the foreign policy markers laid down by the two progressive senator will carry the day when primary season finally rolls around. Bob Dreyfuss, editor of TheDreyfussReport.com, is an independent, investigative journalist based in Cape May, New Jersey, and New York, specializing in politics and national security. He is a contributing editor at The Nation, and he has written extensively for Rolling Stone, Mother Jones, The American Prospect, The New Republic, and many other magazines. He has appeared on numerous radio and television programs, including the PBS Newshour, Democracy Now!, MSNBC’s Morning Joe, and Hannity at Fox News. He has traveled widely and reported from Iran, Vietnam, China, and Tanzania. Dreyfuss is the author of Devil’s Game: How the United States Helped Unleash Fundamentalist Islam.